Elsie will be managing the operations and internal running of the Digital Frontrunners programme. We recently hosted our third Digital Frontrunners workshop in collaboration with Finland’s Prime Minister’s Office. 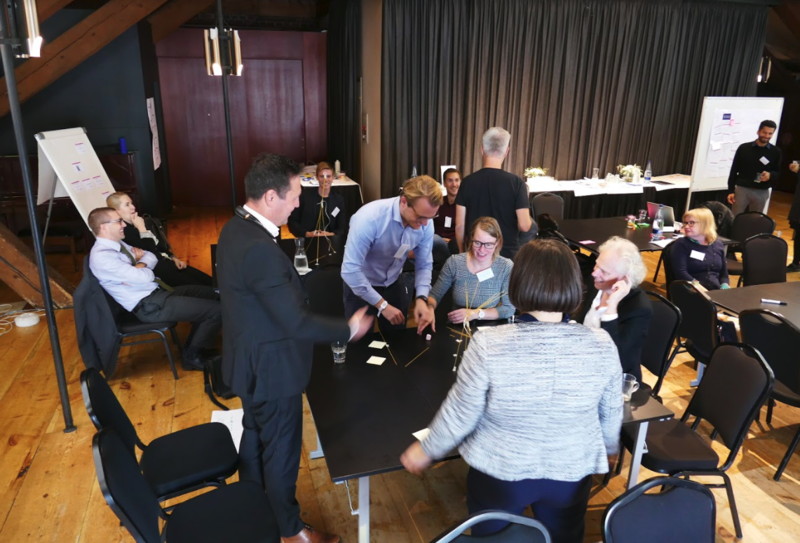 The event in Helsinki brought together over 30 policymakers and experts from the Netherlands, Sweden, Estonia, Finland, Belgium and Denmark who have a mandate to deliver a future of work for all. Following the double-diamond design process, the two-day workshop demanded that participants shifted from a ‘discover’ mentality to one of ‘definition’ across two days. We framed this journey by presenting participants with four policy challenges that need to be overcome in order to deliver an inclusive digital economy. These four challenges framed the activities and discussions held over the two days of discovery and definition. When faced with challenges like these, it is tempting to jump straight into defining solutions. In our impatience to find them, we rarely spend sufficient time holding the problem up to the light and interrogating it. This can lead to missed insights, misunderstanding the needs of users, and wrong assumptions about root causes; a recipe for solutions that don’t work. The first day of ‘discovery’ was held in the spirit of holding each of these four policy challenges before generating ideas for how to address them. As inspiration, Eliza Easton presented the latest research from Nesta defining the digital skills that will be most in-demand in a digital future. In this research, machine learning was used to study 41 million job adverts and make predictions about labour market demands. We also heard from Headai, a company that’s leading the way in applying similar techniques in Finland. Headai won the Ratkaisu 100, a challenge prize competition launched by SITRA designed to address Finland’s key future challenges. Establishing the demands of the labour market in these ways is essential in really understanding the skills landscape, prior to designing policies for continuous adaptation of training. They’re also innovative ways of ‘holding the problem’. Another way of doing this was inspired by the UK Government Policy Lab: we held an evidence safari. Around the room, we arranged over 80 easily digestible pieces of evidence relating to digital skills policy. 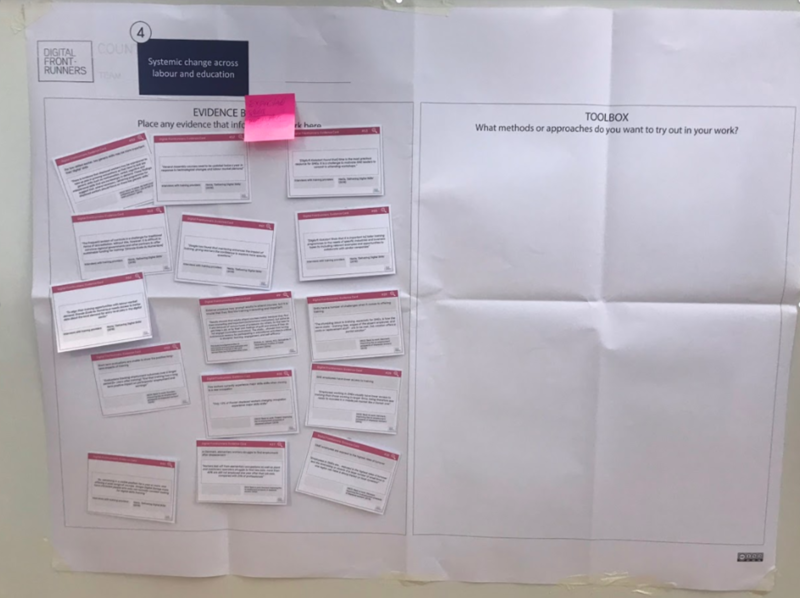 Participants chose one of the four policy challenges to focus on and explored the evidence by moving around the room choosing the cards that were most relevant to their challenge. In cross-country teams, an evidence base for each of the four themes was built. Looking at, connecting and discussing the evidence in this way is an effective way to better understand a problem. It allows quick interrogation of a wide range of sources, with a freedom missing in traditional desk research. It means you build an evidence base for a policy challenge as a team of experts, each bringing their unique perspectives to the conversation. For example, an evidence card that provided an ‘aha’ moment for the team working on the self-motivation theme: research on the motivation profile of adult learners indicates that rewards can actually disincentivise people from participating in training, because the reward becomes the focus rather than the value of the activity itself. Insights like this one proved key in the prototyping that would ensue on day two. Following a day of immersion in the policy challenges, we asked participants to engage their experimental spirit. We kicked this off with an old classic, the marshmallow challenge: teams must build the tallest free standing structure out of spaghetti, tape, and string capable of holding a marshmallow. The most successful teams prioritise iteration over deliberation, trying a number of approaches; experimentation over cautiousness, not waiting until the very end to see if the approach works. We learned from Finland’s Prime Minister’s Office that these are qualities they are seeking to foster in policy making too. The pioneering initiative Experimental Finland invites citizens, organisations and communities to test solutions to policy challenges in order to find out what might work at scale. A recent open call for experiments launched on the website in September 2018 specifically focused on building digital skills and lifelong learning capacities in the health and social services sector. The initiative seeks to build a culture of experimentation inside government as well, for example by developing curricula around experimentation and training civil servants in behavioural science approaches. Inspired by Experimental Finland, and building on the evidence safari from the day before, our group got creative and prototyped solutions to the four policy challenges (see below the blog for their ideas). In the spirit of the marshmallow challenge, we asked them to do this quickly and iteratively without the pressure of trying to find a perfect solution. It’s difficult - especially when you’re an expert - to abandon the notion of finding the ’single right answer’ to a problem. We helped our group to do this by getting them to look at the question in hand through different lenses. 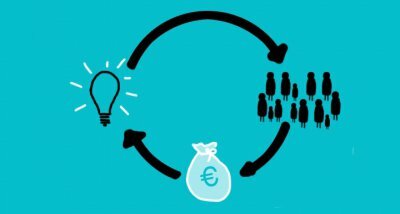 How would an entrepreneur solve the problem? What if money wasn’t an issue? What if there was no money at all? And so on. We took our participants on a two-day journey designed to challenge assumptions and put them in a creative space to generate fresh ideas. Most of all, we wanted participants to inspire each other and collaborate on addressing challenges affecting us all. The four challenges were not solved in Helsinki - as much as we would love to claim otherwise. We have a great community of very committed and experienced experts, with a deep understanding of what the key challenges are, equipped with inspiring ideas for how to solve them. This is a brilliant starting point on which to build further research, discussion and activity. We are excited for the next steps in this journey as we continue to build this international community. In the meantime we look forward to sharing the lessons we’ve learned along the way in an upcoming report due to be published later this year. We will also be continuing to share inspiring examples of best-practice from across the Digital Frontrunner countries through our Spotlight series, the next one about Finland will be published later this month. Harness AI to develop a system which provides live information on skills supply and demand in the labour market. 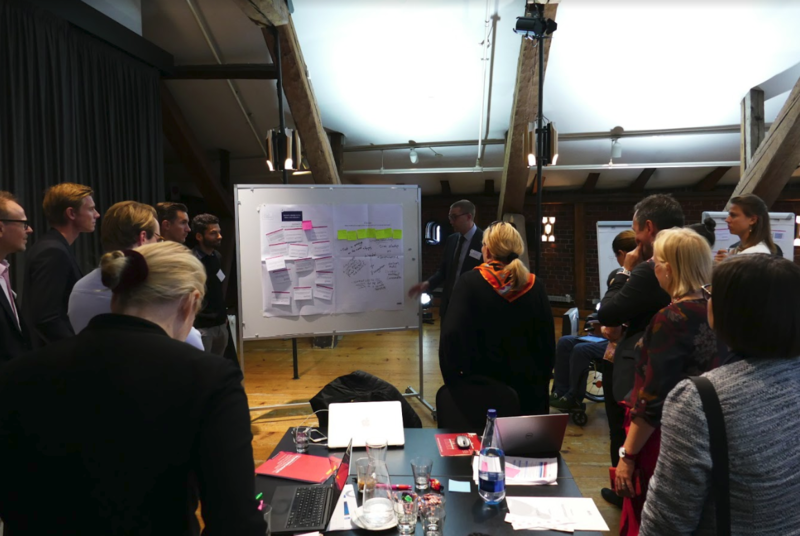 Partnership building plays a great part in the project: people from businesses, ministries, unions and educational institutions come together to evaluate the findings on skills and agree on courses of action, e.g. investing in training. Based on the findings, an up-to-date live curriculum could be developed. "Engage in regular monitoring and evaluation. Rigorous evaluation of training programmes helps to improve their design by clarifying what works, what does not work, and under what conditions and for whom. Building monitoring and evaluation into the design and implementation of training programmes will help to ensure that scarce public resources are used efficiently and effectively". "High-skilled unemployed participate considerably more in training measures... low-educated and older unemployed participate more in lighter ALMP measures such as rehabilitative work experience that have note proved to be very effective"
"Those who did not find a job within one year face a high risk of remaining jobless for a long time if not forever, especially if over the age of 55. This is also because new jobs are not always created in the regions where jobs are lost"
“Holder (2007) examined predictors of persistence in online higher education programs. Based on responses from 259 participants, the study found that emotional support, self-efficacy, time management, and learner autonomy were influential factors”. "As stated by SDT [self-determination theory], when individuals are given (or expect) rewards for the performance of an activity, the reward becomes the main focus and they lose interest in the activity itself”. Prototype Idea: ‘A one stop shop’ for lifelong learning connecting employees and employers. 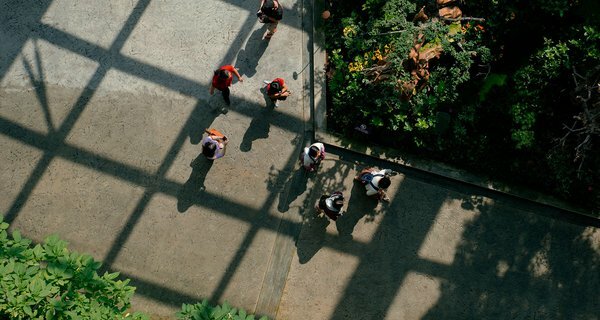 "Long-term employment within the same organisation has become increasingly uncommon and workers have recognised the need to develop new skills throughout their careers." “Looking at situational barriers, lack of time and cost issues are given as the most prominent reasons for nonparticipation in previous research” (Desjardins, Milana, & Rubenson, 2006), whereas problems with scheduling or finding appropriate courses are reported as institutional barriers”.